The author of 东方花逐夜 has made a facsimile of Danmaku Amanojaku Gold Rush . All information of this game comes from videos recorded at Digital Game Expo and players' descriptions. I have re-uploaded another folder renamed to English. Huh. Took them a few days. I'm hoping that ZUN will let everyone download it for free from his website, as it's apparently not supposed to be sold. I'll download it when I get home. Do you need AppLocale for this? Hm... when running th143GR.exe the screen comes up weird. It's obviously just missing the graphics, though, so I looked and there are no files in the "graphics" folder. So I went to gamedat.rar to extract them but it requires a password. Maybe there's something in the readme, but sadly I can't read Japanese ^_^ Any idea what the password might be? Or a different way to fix it? It's in Chinese. A quick Google Translate of both readme files show no signs of a password being given. The problem seems to be related to the game folder's name. After renaming to something English, the graphics showed up. Wow, this is really nicely done. Fun little game, and the autocollect is indeed really cool. You get a lot greedier about your paths - no taking it Easing. maybe the folder's name cannot be Chinese. This is really fun, though I can see why ZUN didn't intend to release it publicly. It's clearly not intended to be replayed over and over. 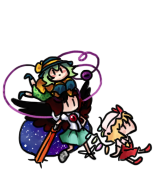 Not that it'll stop me from doing so =P I love how Reimu's practically helping you by the last card. Forget danmaku battles, just turn this into gold and give me some donations! Changed the folder name and everything works perfectly. Excellent find, rsy, and thanks for posting it! One thing though, is there any way to scale/change the game's resolution? I've gotten used to playing @ 1280x960, so a window half that size throws me off. Window can be changed to Full Screen in the ingame options. There doesn't seem to be any more choices. This is a really fun little game. Yeah, I eventually settled for fullscreen with black bars on the side. Beats the hell out of 640x480, if anything. Cool stuff. Nice to see that through this people can still get to play the game even though it's a super short mini type of game. Screen filled with gold makes this look more like a Cave game than a Touhou game. Make a short video about it. Not sure if it's a good score or anything. Something feels a bit weird though...my Bitdefender classifies it as a virus and originally stops it from running. I fixed it by making it an exclusion, but it still seems kinda weird to me. Any ideas? I'm getting it when I clear the game and when I attempt to save a replay. Change the name of the game folder to something English. Can't you just run it with AppLocale set to Chinese? Err... this is the exact kind of game that should be played over and over. At one point, "score attack" levels like this were created for numerous games and featured in tournaments, and in a way Extra Stages succeed this concept. Gold Rush is really just an Extra Stage by itself, and it ends up playing more like a caravan stage because of that. A single stage is also a lot easier to learn than a whole game, and it's great for the kind of tourneys where you get a game a week. *Ehem* If you're asking to me I'm ALREADY running it with AppLocale in Simplified Chinese.